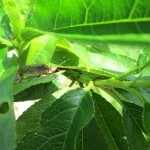 Beginning last night at RAREC (south Jersey) BMSB began moving in ‘larger’ numbers into peach orchards. They immediately were observed mating. This occurred at about 284 DD (base 57°F) at RAREC. Degree-day accumulations were slow this year and last week were delayed by the rain and cooler weather. In north Jersey the degree-day accumulation should occur today 5/30 or tomorrow 5/31 for the dispersal into fruit orchards. We advise that you monitor the woods edge of orchards for stink bug activity and treat if BMSB is found. Plum curculio is still active throughout the state but should be approaching the end of oviposition activity in south Jersey. If PC pressure is high, chose a compound that has activity against both PC and BMSB such as Actara (5.5oz), permethrin (16oz.) or Warrior (5.12oz). We are between generations for OFM but Codling Moth timings are upon us (see Dean’s pest report) for north and south.